Challenges loom large, even in the smallest office. The compact RICOH® Aficio® SP 3500SF/SP 3510SF offers an innovative multifunction feature set that fits your unique needs and budget. It handles a wide range of document management tasks easily like ID Card Copying, Internet Faxing, and Scan-to-Email with LDAP (Lightweight Directory Access Protocol) support. Operate more efficiently with fast 30 page-per-minute output speeds, and maximize uptime with Ricoh’s proven All-In-One Print Cartridge technology. Increase productivity with your choice of an Automatic Document Feeder (ADF) or Automatic Reversing Document Feeder (ARDF) to make multi-page scanning and faxing a snap. The intuitive control panel with an easy-to-view 4-line LCD control panel simplifies multitasking and allows home offices and workgroups to run more smoothly than ever. A smaller office doesn’t mean less work — only fewer resources. The multifunctional Ricoh Aficio SP 3500SF/SP 3510SF handles a wider range of tasks cost-effectively. It consolidates copy, print, scan and fax capabilities in an easy-to-use, desktop solution that streamlines everyday document management workflow for superior productivity. With its competitive hardware costs, electronic distribution features and intuitive 4-line LCD control panel, this convenient device is the perfect choice for multitasking on a budget. Keep pace with the busiest demands. With a fast 30 second warm-up time and copy/print speeds of up to 30 pages-per-minute, users can transition to the next job with ease and efficiency. Deliver crisp, clear output with up to 1,200 x 1,200 dpi for applications needing the best possible output quality. The Ricoh Aficio SP 3500SF includes a standard 35-Sheet Automatic Document Feeder (ADF) and the SP 3510SF offers a standard Automatic Reversing Document Feeder (ARDF) to expedite copying, scanning and faxing for up to 50 two-sided sheets. 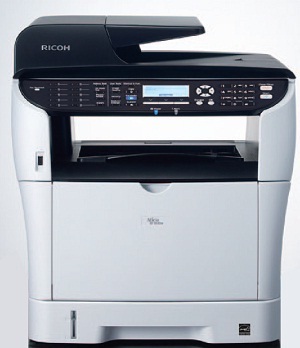 Streamline a wider range of office tasks with the Ricoh Aficio SP 3500SF/ SP 3510SF. Two-sided documents like insurance cards and checks can be reproduced on the same side of a single sheet with one press of a button with ID Card Copy. The standard 250-Sheet Paper Tray and 50-Sheet Bypass Tray accommodate thick paper stocks up to 90 lb. Index so users can produce more types of documents in-house. Expand paper capacity to 550 sheets by adding the optional 250-Sheet Paper Feed Unit to handle larger jobs and growing volumes. Maximize resources with a sleek, stylish multifunction device that fits seamlessly into any office environment. The Ricoh Aficio SP 3500SF/ SP 3510SF occupies less than 2 square feet of space for easy placement on or behind the front desk. For optimal convenience, users can generate output at the device using a USB memory or SD card for walk-up operation without a computer. A front-access design simplifies maintenance, and convenient, user-friendly All-in-One print cartridges make toner replacement a snap. Plus, the four-line, intuitive LCD control panel offers fast, easy access to system functions, supply status and contact lists. The Ricoh Aficio SP 3500SF/SP 3510SF offers network capabilities in peer-to-peer or shared-use environments with standard USB 2.0 or 10/100Base-TX Ethernet interfaces. It accommodates the latest Windows and Macintosh technology with support for PCL6 and PS3 emulation, as well as utilities for UNIX and Citrix distributed printing environments. Plus, it offers device management tools, including Web Image Monitor, Ricoh Universal Printer Driver and Ricoh Device Manager NX to manage the device quickly, even from a remote location. Fax documents in seconds and reduce long-distance charges with a 33.6 Kbps Super G3 modem, built-in PC faxing, Internet faxing, and LDAP for accessing company e-mail servers. Advanced scanning capabilities enable users to improve how documents are shared with multiple recipients. The Ricoh Aficio SP 3500SF/SP 3510SF offers high-quality, full-color or monochrome TWAIN/WIA scanning at up to 1,200 x 1,200 dpi optical resolution with 19,200 x 19,200 dpi driver resolution. Users can distribute electronic documents immediately at no cost with Scan-to-Email/ Folder/FTP/USB.